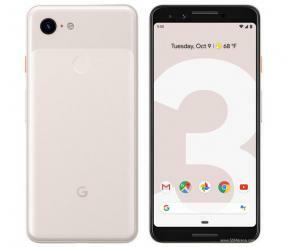 Google's 3rd generation Pixel device, launched in October 2018, sports a 5.5" 1080x2160 (443 PPI) notch-type flexible AMOLED display (6.3" 1440x2960 on the Pixel 3 XL), a Snapdragon 845 chipset, 4 GB of RAM, 64/128 GB of storage and a dual-pixel 12.2 mp camera. The Pixel 3 and Pixel 3 XL are now shipping globally (note: Affiliate link to Amazon). The flexible AMOLED display used in the Google Pixel 3 is produced by LG Display, while the larger 6.3" flexible AMOLED of the Pixel 3 XL is produced by Samsung Display. In October 2018 Display experts from DisplayMate said that the 6.3" Pixel 3 XL Super AMOLED display is a "top-notch" smartphone display and rated it as one of the world's best mobile phone displays. Following the launch of the Pixel 3 smartphone, several early customers complained of the quality of the OLED (produced by LG Display). The major complain was due to a pinkish hue. See here for more information.